*Lemon Balm has been cultivated for the past two millennia. *The Greek physician Dioscorides wrote about it being used for scorpions stings and insect and dog bites. 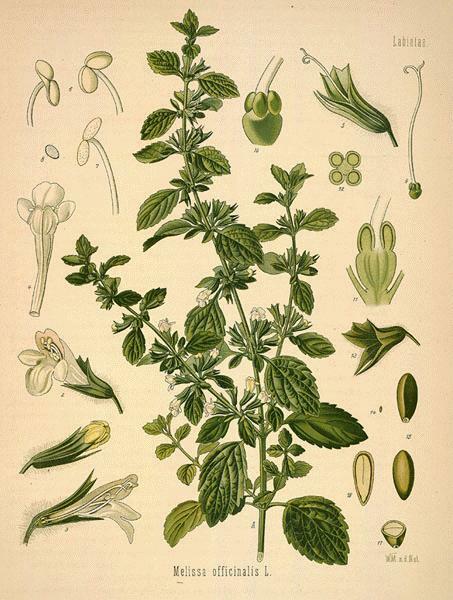 *Shakespeare mentions that Lemon Balm was strewn on the floor of a room to freshen it in “The Merry Wives of Windsor”. *Lemon balm was even included the U. S. Pharmacopoeia from 1840 to 1890. Dozens of modern recipes exist for Carmelite Water, a beverage and medicinal elixir that was used as perfume, to calm the stomach or clear the complection. Created by Carmelite monks and nuns, the exact proportions of the original recipe remain unknown. A perfume containing lemon balm, known as Carmelite Water, was in high demand due more to practicality than the need to allure through scent. Carmelite Water helped to cover the stench of unwashed bodies as bathing was considered an “opening” for sinful thoughts due to exposure of naked skin to the eyes of the bather. As most people of that time period only bathed once a year, or in some cases once a lifetime, the need for sweet smelling perfumed waters was very high. Carmelite Water also covered the smell of disease (plague), death (from plagues), and filthy living environments (attributors to plague) so rampant at that period of human history. 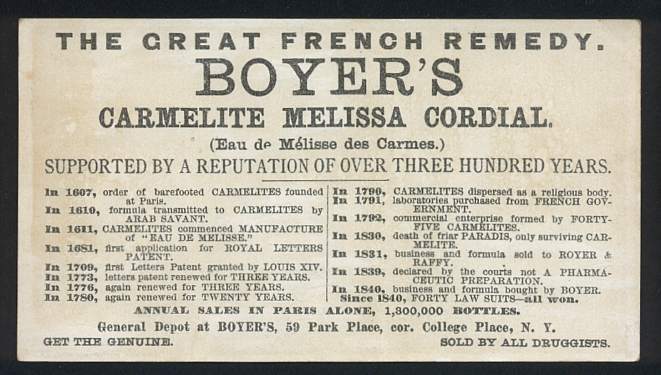 The recipe for Carmelite Water was so prized that patents for it, under the name ‘Eau de Melisse des Carmes’, were granted by Louis XIV,XV, and XVI of France. This perfume patent was kept inviolate secret by the Carmelite friars who made it. All that is known of the patent recipe now is it was comprised of lemon balm flowers, coriander seeds, angelica root, nutmeg, cinnamon, and cloves pounded together and steeped in wine, (15) Carmelite Water was also used as a internal and external remedy for just about all ailments suffered in that period of history. 1.pour the vodka into a jar. 2.Add the remaining ingredients,cover tightly and shake. 3.Leave in a warm place for three weeks, shaking every day. 4.strain into a sterilized bottle and store in a cool place. Use within six months. The root-stock is short, the stem square and branching, grows 1 to 2 feet high, and has at each joint pairs of broadly ovate or heart-shaped, crenate or toothed leaves which emit a fragrant lemon odour when bruised. They also have a distinct lemon taste. The flowers, white or yellowish, are in loose, small bunches from the axils of the leaves and bloom from June to October. The plant dies down in winter, but the root is perennial. Easily grown from seed sown in the spring or early fall, lemon balm is a fantastic addition to the herb garden. Additionally, it can be quickly established from root division and cutting (if fall planting, be sure to do so in time for the plant to establish before the first frost and mulch for the winter). Lemon balm is less invasive than mint, but still requires attention to prevent it from spreading as it does self-sow and spread. For a bushier, compact plant, trim sprigs frequently. It prefers rich, deep and moist soil (pH 5-7.5) and partial shade, though it will tolerate direct sunlight (but growth will be adversely affected). If you are planting in large amounts, the suggested spacing is 12-24 inches between plants as close spacing results in the highest yields. Lemon balm is easily grown in a container, for those with a lack of yard. This herb can be easy to cultivate in United States Department of Agriculture Plant Hardiness Zones 4 to 9. In zone 4, it needs winter mulch and a well-drained sandy soil to survive. In zone 7, it can be harvested at least until the end of November. It is moderately shade-tolerant, much more so than most herbs. In dry climates, it grows best in partial shade. Lemon balm can be harvested for fresh use once or twice a week and leaves can be kept in the fridge for a few days, or be frozen. Leaves should be handled delicately as they tend to bruise and turn black. Hang sprigs to dry in dark cool place. Be sure to keep out of moisture, as leaves are prone to browning and more susceptible to mold. Store dried leaves in air tight container. The leaves lose some of their flavour when dried. Lemon Balm is most commonly used as an infused oil, essential oil (though it is often fraudulently diluted with cheaper oils), or tea. Studies have found Lemon Balm, in combination with other calming herbs can reduce anxiety and promote sleep and that Lemon Balm can improve mood, calmness and alertness. Other studies show that Lemon Balm may help heal cold sores associated with herpes simplex virus resulting in an improved appearance and faster healing time of the lesion. In a clinical study of 115 patients with herpes, a cream containing 1 percent dried lemon balm extract was applied by the patients as needed five times daily for up to fourteen days until healing of herpes lesions was complete. In 96 percent of the patients, lesions were healed by day eight of the treatment, in 87 percent by day six, and in 60 percent by day four. Unassisted healing usually takes ten to fourteen days. A subsequent randomized, placebo-controlled, double-blind study compared the effect of the same cream with a placebo. Both physicians and patients judged the lemon balm cream superior to the placebo; it was found, however, that treatment must be started very early in the infection as accelerated healing was most pronounced in the first two days. Lemon Balm has been recommended for a variety of health problems. Studies conducted in Germany propose that essential oil of Lemon Balm acts upon the part of the brain governing the autonomic nervous system and protect the cerbrum from excessive external stimuli; this idea supports some of the claims that Lemon Balm might be of assistance for patients with Alzheimer’s, attention deficit hyperactivity disorder, and insomnia. Some evidence has also suggested that Lemon Balm may be of use for patients with Graves disease, a specific thyroid disorder that causes hyperthyroidism. Lemon balm may be used topically in children to treat cold sores. The dosage would be the same as the recommendations for use in adults. For internal use, adjust the recommended adult dose to account for the child’s weight. Most herbal dosages for adults are calculated on the basis of a 150 lb (70 kg) adult. Therefore, if the child weighs 50 lb (20 – 25 kg), the appropriate dose of lemon balm for this child would be 1/3 of the adult dosage. Tea: 1.5 – 4.5 grams (1/4 – 1 teaspoonful) of dried lemon balm herb in hot water. Steep and drink up to 4 times daily. For cold sores or herpes sores, steep 2 – 4 teaspoonfuls of crushed leaf in 1 cup boiling water for 10 – 15 minutes. Cool. Apply tea with cotton balls to the sores throughout the day. When making tea, don’t steep the leaves too long or it becomes bitter and may cause headaches. No side effects or symptoms of toxicity have been reported with lemon balm use. Even so, this herb should not be used by pregnant or breast-feeding women. Also, lemon balm may interfere with sedatives and thyroid medications if you either of these, you should consult your health care provider before taking lemon balm as a medicinal preparation. Can be used in love spells and charms. According to Beyerl, it can be used in rituals to the goddess Diana, as it was thought to have been sacred to her. Lemon balm can also be used in as an ingredient or substitute for related to lunar matters. – Boil the farro in abundant salted water until soft, it usually takes 20-30 minutes. – Meanwhile you first either grate the zest of the lemon or you use a lemon zester and put it in a pan with the garlic and some olive oil. Braise for a minute before adding the diced zucchini and go on braising until the zucchini is sift and golden. – Add the pistachio nuts and the farro and then drizzle a little of lemon juice over it. Add the Lemon balm and stir. Blend all ingredients together in a food processor until chunky, but not too well blended. Use to baste broiled or grilled fish or chicken, or serve as traditional pesto over pasta. (See recipe below.) Makes about 2 cups. Your website is great. I would invite you to visit my blog, google search “The Wild & Weedy Kitchen” … I am learning how blog, so if you have any suggestions, please send them! I referenced your site looking up Carmelite Water… some say it was prepared by monks/friars, some say by the nuns. Difficult to say. I LOVE lemon balm, and also want to try your “freaking delish” recipe next summer when the zucc’s are ripe. I too was so interested in the recipe for “eau de Melisse des Carmes” or Carmelite Water. I read about it in a book where it was referred to as a lotion for the hands. Very nice information, many thanks. You might want to know that comprised is never used with of, however. Composed of is correct, but not comprised of. The whole is composed of the parts; the parts comprise the whole. Blessed Be.